The new gold standard in laptops—when it comes to design, performance and value—is now available in a shade of copper. Packed with features and debuting at an affordable price, the 2015 version of HP’s Spectre x360 was the darling of the tech community. In late 2016, HP made some bold design refinements—slimming down the footprint of the Spectre by reducing the screen bezels and adding Intel’s latest processors to the mix—making the late 2016 13-inch model one of our favorite picks for the year and the notebook to beat. So how do you make an already great laptop even better? HP is back at it with its early 2017 refresh, adding more polish and features—like a crisper display, inking support and a trendy new color to match its larger 15-inch sibling in the family make the Spectre x360 13-inch our new favorite pick for this year. Unlike the late 2016 silver version, you won’t mistake this model for the MacBook, and that’s a great thing. HP’s design has really matured over the past few years, as the company tries to capture more of the high-end market, and the Ash Silver color is really stunning. The color is the same hue as found on the 15-inch model that we reviewed earlier this year, and it’s unmistakably HP by design. Finished in a unibody aluminum housing with a brushed, anodized dark coppery grey tone and polished copper accents on the sides, the Spectre looks more like a piece of modern desk art than a technological tool to accomplish work. On the matte lid, this color combination really looks sophisticated, with HP’s angular logo etched in golden copper. The Spectre x360 is just as slim and light as it is beautiful, measuring 12 × 8.5 × 0.5 inches and weighing 2.8 pounds. Its size and weight compares favorably against rivals in this space. The Spectre’s light weight, compact size with its Micro Edge screen with its beautiful near-bezel-less design, bundled HP Active Pen, Windows 10’s inking support, and strong battery life performance make this a terrific convertible for mobile use in academic, professional and travel settings. Although the Spectre occupies a slightly larger footprint than Dell’s XPS 13 2-in-1, for example, it’s still 0.04 inches thinner, which is a marvel of engineering given that the XPS uses a less powerful fanless Intel Core M processor. The 12.72 × 8.84 × 0.56-inch dimensions of Lenovo’s Yoga 910 slots right in between the 13- and 15-inch Spectre models, given the Yoga’s 14-inch screen size. Much of what we loved about the late 2016 Spectre design remains on the 2017 model, including Thunderbolt 3 support on the two USB Type-C ports, the inclusion of a USB Type-A port for legacy devices, a standard 3.5mm combo audio jack for headphones and microphones and HP’s fast charging technology and the room-filling and balanced audio of the Bang & Olufsen-tuned quad-speaker array. Like its slightly older sibling, there are two upward-firing speakers and two bottom-firing speakers, delivering robust sound that won’t get muffled regardless if you’re using the Spectre as a notebook or as a laptop. Audio produced by the Spectre x360 sounded excellent, and I had no problems with audio fidelity even when the speakers were cranked up to higher volumes. Compared to HP’s business-class EliteBook x360 G2 that I recently looked at, audio sounded louder on Spectre. HP notes that the EliteBook is tuned for video and business conference calls, and the Spectre x360 is tuned more for entertainment. That said, my Skype and Google Hangouts calls on the Spectre sounded terrific, and the other party said that they had no problems hearing me. Aside from the change to a darker colorway, the star of the 2017 show is the upgrade option for a higher resolution 4K UHD panel. While you may not even notice individual pixels at the standard 1080p resolution, having a 4K display is a joy for photo and light video editing as well as for media consumption. The screen is tack sharp, and HP claims that the display covers 72 percent of the color gamut. While the 16:9 aspect ratio screen—compared to the Microsoft’s Surface line’s 3:2—may feel a little cramped, if you have good eyes, reducing the scaling inside Windows 10’s display option will still give you a sizable canvas to work with. I found that things scaling to 175 to 200 percent gave me plenty of screen real estate to work from. Like its most recent predecessor, the 2017 model also comes with slimmed down bezels. The idea isn’t different from what rival Dell has been doing with its Infinity Display on the XPS 13 model. HP calls its design Micro Edge Display. However, because HP opted to place the 720p HD webcam up top, the screen slimming effect isn’t as dramatic as what Dell achieved on the XPS 13 2-in-1. The reason why HP opted to place the webcam at the top of the display, rather than the bottom placement on the XPS 13, is that this location allows the camera to capture a more natural angle, making it more useful for webcam calls. The camera also comes with a built-in IR sensor for use with Windows Hello, allowing you to use your face for a password-less log in experience to Windows 10. Pen support now is standard on the 2017 models of the 13-inch Spectre x360. HP bundles its Active Pen in the box, and the feature should be a strong sell for business users looking to take notes during meetings or students who need to capture handwritten notes. Microsoft’s Creators Update also adds more robust inking support in Windows 10, and programs like OneNote will help users get the best of digital and analog note capturing. To avoid confusion between the late 2016 13-inch Spectre x360 and the newer 2017 model with inking support, Mike Nash, Vice President, Consumer Experience and Portfolio Strategy at HP, told me that Best Buy retail locations have already discontinued sales of the Spectre units without inking support. This moves that if you’re new to HP’s latest Spectre x360 design refresh, you’ll be able to choose between models with FHD or UHD displays, both supporting touch and pen inputs. Aside from the negative impact that such a high resolution panel will have on battery life, the Spectre x360 comes with notable refinements from its predecessor, keeping it our top pick for an Ultrabook or convertible in 2017. The 4K panel looks fantastic, rendering colors and details crisply. At lower brightness settings, the display could be a bit reflective, and I found myself turning up the brightness to reduce glare on the glossy panel. The screen gets fairly bright, clocking in at 340 nits, unlike the EliteBook, so you shouldn’t have a problem working in shaded areas outdoors. Don’t be fooled by the Spectre’s striking good looks—underneath its aluminum-clad body is a fast performing system with Intel’s latest processors. Our $1,600 review unit came loaded with an Intel Core i7-7500U processor clocked at 2.7GHz, 16GB RAM and a fast 512GB PCI-NVMe solid state drive. The internal components largely mirror the late 2016 model that we reviewed earlier, and likewise, performance is very similar. What sets the Spectre x360 apart from the competition is how much technology HP is able to pack into such a compact device at this price point. For comparison, a similarly equipped Microsoft Surface Laptop retails for $2200, a $600 premium over the Spectre. On the Surface, you’ll get a 3:2 aspect ratio display, but you won’t benefit from the 4K resolution or the convertible form factor, and Microsoft’s laptop also doesn’t seem to be as future-proof of an investment as it lacks Thunderbolt 3 and USB Type-C ports. Dell’s XPS 13 2-in-1 shares the Spectre’s 360-degree hinge, but sacrifices performance in favor of a more anemic processor, and at the starting $999 price, you’re compromising on screen resolution, inking support, storage and RAM. With the 2017 Spectre x360 13-inch, HP delivers a more balanced, high-end notebook at a great value. Inking comes standard on the 2017 13-inch model. 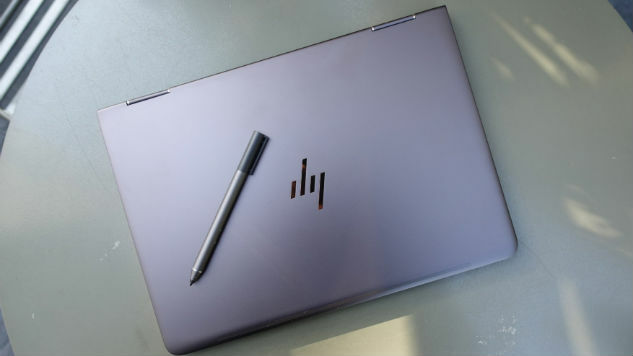 Like the larger 15-inch Spectre refresh, the 2017 13-inch model ships with HP’s Active Pen, which utilizes the same N-Trig technology found on Microsoft’s Surface Pen on the Surface Book, Surface Pro 4, Surface Studio and Surface Laptop. You can use the pens interchangeably, but unlike the Surface Pen, HP’s option doesn’t come with replacement tip options to replicate the feel of different pens and pencils, nor does it come with an eraser with an integrated quick launch button to pull up Windows Ink. I found the pen to be accurate, and it was able to keep up with my note-taking and doodling. As I am not an artist, I can’t attest to how well the pen performed when tasked with more intricate creative work. For students and business executives, it’s really handy to be able to capture handwritten notes, sign PDFs and annotate images and web clippings. Even though real life performance is fast, the 4K display did affect benchmarked performance. Having to push information to that many more pixels showed that the 4K 2017 model suffered a bit under PCMark 8 and 3DMark tests, but performance on Cinebench between the FHD and 4K models was similar. The 2017 model scored 2,681 points, for example, on PCMark 8 Work test, down from a score of 3,205 on the late 2016 FHD model, showing that the 4K display added some strain to the processor. Unlike the 15-inch Spectre x360, the 13-inch model doesn’t ship with discrete graphics, and you’ll have to make due with Intel’s integrated HD Graphics. In my use, I didn’t notice any performance gap between the two models, and both were equally fast at handling multiple web browsers running multiple tabs, running Microsoft Office, handling light photo editing in Photoshop and playing video. An area that actually takes a real-world performance hit when it comes to the new high resolution 4K display is battery life. In use, with the display set to around 75 percent brightness, my Spectre x360 is able to deliver close to eight hours of battery life, which should get you through most of the work or school day. If you do need to recharge, the nice thing about the Spectre is HP’s fast charging technology, allowing you to replenish up to 50 percent of your battery in as little as thirty minutes. That means recharging your Spectre x360 during a 30-minute lunch break will give you roughly an additional four hours of use. The square charger that ships with the Spectre is a small black brick that is very reminiscent of Apple’s elegantly designed charger in white. Unlike the charger that ships with Apple’s recent MacBook Pros, however, HP also bundles in an extension cord, which will help you reach oddly placed wall sockets at coffee shops. And if you want a form factor that’s similar to the Spectre x360, going with the Dell XPS 13 2-in-1 means you’ll compromise on performance. While the Spectre ships with an Intel 7th Generation Core i7 processor, the XPS 2-in-1 is only available with a more conservative Core M CPU. Lenovo’s Yoga 910 with a 4K panel, 512GB SSD and 16GB of RAM comes in cheaper at $1,349, but you’ll sacrifice some of the Spectre’s versatility given that the Yoga 910 comes with a larger 14-inch screen and lacks Thunderbolt 3 support. And when it comes to ports and expandability, the Spectre x360 wins against Microsoft’s flagship Surface Laptop by a long mile. Aside from some compromises in battery life that comes with a high resolution 4K display, the 2017 Spectre x360 13-inch is the closest thing we have to laptop nirvana right now. HP’s Midas touch gives us a sturdy unibody metal body with an elegant copper design, robust performance with the latest Intel processor and a keyboard that’s a dream to type on. Add to that the versatility of a convertible hinge, pen support for inking and creative work and future-proof potential with Thunderbolt 3 ports and you have a laptop that you’ll be happy with for years to come.